I love this picture of Steve Bannon with the beautiful Sarah. It proves that Bannon recognizes true talent. My question is… why hasn’t Sarah been offered a position yet? 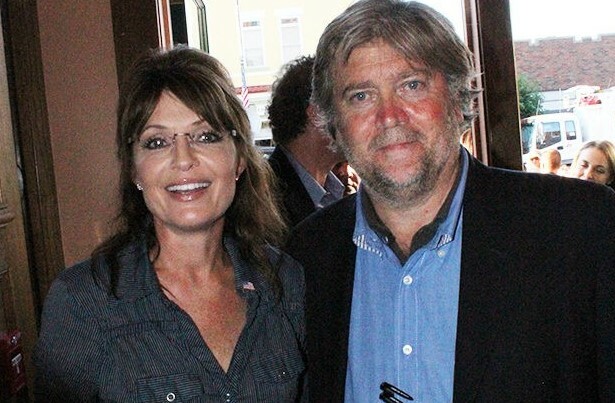 Ruairí Arrieta-Kenna writes at Politico that before Stephen K. Bannon “embraced the mogul from Manhattan,” the former Breitbart Executive Chairman and current chief strategist to Donald Trump had his eye “on another gifted populist” outsider — former Alaska governor Sarah Palin. Both Bannon and Palin realized that the Republican Party needed to “drain the swamp” in DC and champion the forgotten American working class if it ever wanted to regain the White House again. Except Bannon wasn’t thinking about Donald Trump. The dream candidate he had in mind? Sarah Palin.